It has been a whole month since my last post. Sorry, I just got out of the habit, and have been busy with boring stuff. I did manage to prune the roses, but didn’t take care of the old tomato plants. Look what I saw on Christmas Day. Being lazy gave a squirrel a rare December treat. The next day these tomatoes were gone so, they were eaten by a squirrel or a crow. I hope it was a squirrel. I quit teaching the sewing classes at Viking this week. I just wasn’t having fun since the dealer kept taking stuff away from the class. First a cutting table, then the serger, and finally the open-toe foot I liked to have on hand for students to use to attach trim. When I complained and asked her to reconsider, especially for the serger, she said, “NO, deal with it.” I dealt with it by telling her to get someone else to teach the classes. 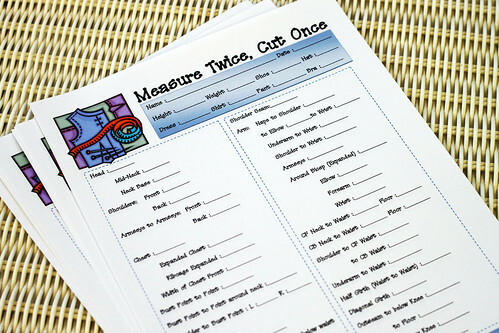 I made this cute measurement form for my students using a trial version of office that came with my new laptop. I saved it in a file format I can open on the mac (.doc). I will use them for Alex’s friends cos-play costumes so they won’t go to waste. All the horizontal measurements are on the left and the vertical ones are on the right. They are listed from head to the floor on both sides, so I can go down the list do not have to go up and down on my old knees. It is similar to the form I used in my costume shop work. Back then, some days all I did was measure people. If I am making something for an individual I like having all these measurements handy. Just makes checking things before a fitting easier. Email if you would like me to send you a copy of the sheet. If you want the font I used, I can send you that file too. Machine cut-work. This is cut out by putting a blade in instead of a needle. This is an included design. I still need to learn how to digitize a design of my own. Here is something I did digitize. I scanned an image of the way Rick signs his paintings. I want to embroider this on a shirt for him, either on the pocket, or in the center back of the yoke. I think on the yoke would be a bit more artsy placement, though it might be weird. I still need to make some adjustments to the digitizing, but am happy how I managed to remove all the really long satin stitches in a way that went with the look of the letters. 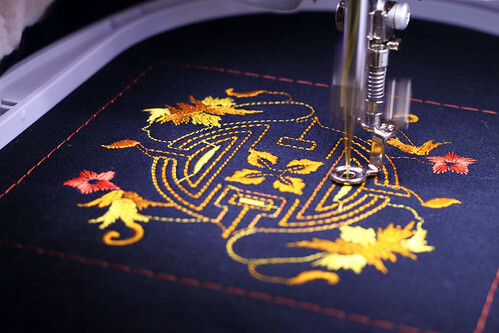 Last is an embroidery design that DesignerPlus V6 came with. I am thinking of making a little bag out of it. The kind of bag that is round and hangs from the wrist. 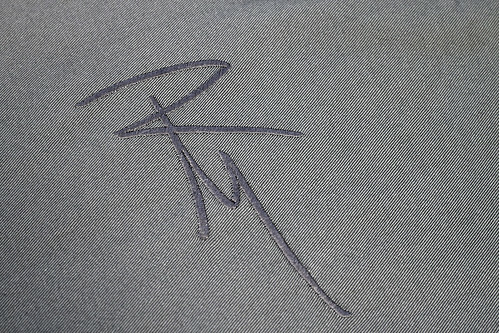 The first photo is of it being embroidered. I am still amazed watching the embroidery, though I am getting comfortable leaving the room when the longer colors are being embroidered. I hope to post more frequently now that I no longer have to go to work. 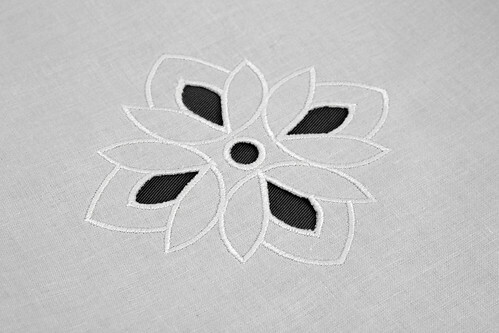 This entry was posted on Friday, January 15th, 2010 at 3:00 am and is filed under Bernina 830, Embroidery, Garden and Sewing. Tagged: Embroidery, Garden, Sewing. You can feed this entry. You can leave a response, or trackback from your own site. Fresh tomatoes (for somebody!) on Christmas! What the heck am I doing living in the Northeast?! The embroidery is beautiful–looking forward to seeing what you’ll be doing with it. Love the embroidery and the cutouts. You must be having a blast with the machine. Sorry about the class…some people have none. Hope all is well with you. Sounds like your sewing students will miss you – I bet you were a great teacher. Pleased to hear that somebody else just gave up at the end of the tomato season. 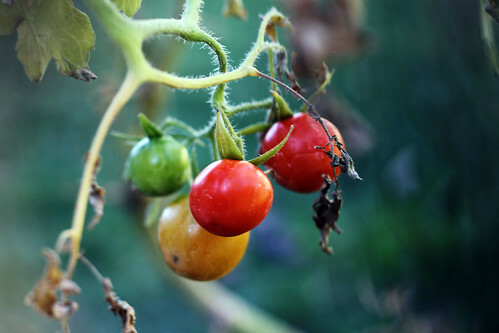 I planted too many cherry tomato plants this year, and lost the will to eat them. Nice to have you back. I love the embroidery motifs. Looks like fun times with Belle! The embroidery is just wonderful and so is the cutout. Some people just don’t get it. Viking will realize what they’re missing without you there anymore. I wish you didn’t live on the other side of the country as I’d love to take private sewing lessons from you. Where to start!? First – happy to see you back in blogland again – you have been missed. What is up with Viking? Their loss! 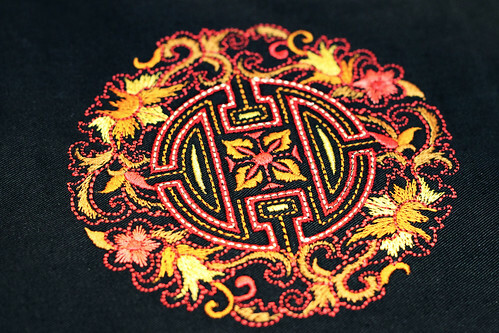 Now as for the embroidery work you are doing – wow – gorgeous stuff. The monogram is so elegant and the lovely design motif in golds is so perfect – you have definitely got a good relationship going with that fabulous machine! I bet it brews coffee too :o) I’m with the other ladies – sewing lessons with you as our instructor would be awesome!